The Cavaliers won their first game in regulation since Nov. 27 last night, against the Lakers of all teams.It’s a nice win for the Cavs, especially consider last month’s embarrassing 55-point loss to the same two-time defending champs. So congratulations Cleveland. But the story of the day is the Lakers struggles. Here’s a quick reminder: we’ve already seen this movie. The Lakers lose three or more consecutive contests, including some defeats to bad teams (as they did around Thanksgiving and Christmas). Kobe gets blamed for taking too many shots (he went 8-of-24 last night). And everyone hits the panic button in LA – only for the Lakers to rattle off a string of wins and render the speed bump obsolete. That said, the Lakers were exposed last night. They simply can’t hang with quick point guards. 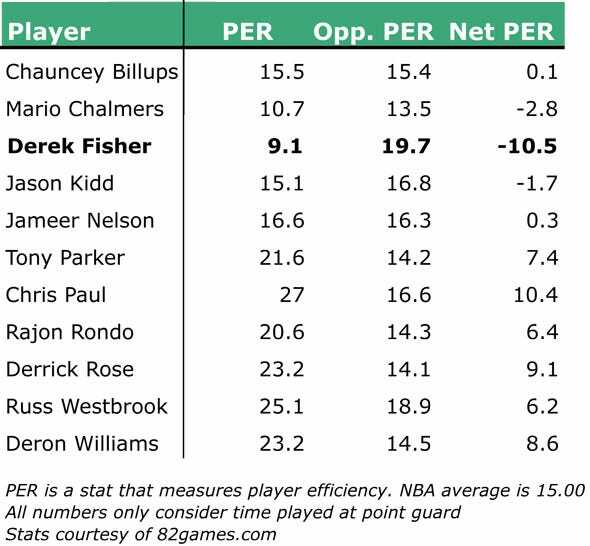 Check that – Derek Fisher can’t hang with quick point guards. Lightning-quick Cavs point guard Ramon Sessions abused Fisher for 32 points last night. And Sessions is nothing compared to the point guard talent on the league’s elite teams. The same teams the Lakers will have to overcome to attain their third consecutive title. 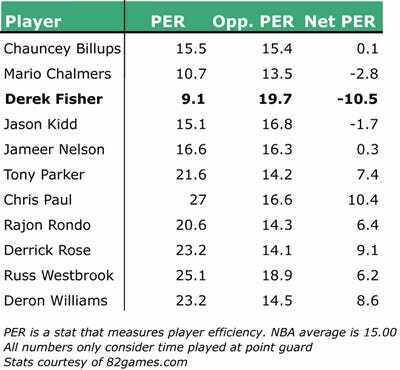 Rajon Rondo, Chris Paul, Russ Westbrook, Deron Williams, Derrick Rose, and Tony Parker have all dominated their opponents throughout the season, and Jason Kidd, Jameer Nelson, Chauncey Billups, and Mario Chalmers, have at least kept things even. But Fisher gets killed, night in and night out. Clearly, rather than participating in the ‘Melo sweepstakes, the Lakers need to dangle Artest to shore up the point guard position. rumour has it, ‘Melo’s teammate, Billups could be had.